3D Printing in clay via extrusion appears to have begun in late 2009 with the efforts of Belgium-based Studio Unfold and shortly thereafter in 2010 with the work of UK-Based Potter Jonathan Keep. In 2014 Jonathan and Dries Verbruggen of Unfold Studio began a forum titled “Make Your Own Ceramic Printer” on the (as of January 2019) soon to be shuttered Google+ platform. Nearly all of the development of extrusion clay printing that has followed, whether corporate or personal, open source or closed, seems to have had a steady connection with Dries and Jonathan’s user forum. When 3D printing in clay or other paste/syringe materials, one quickly runs into the problem that it is difficult to supply more than a small amount of clay to the print head without making the print head very heavy. Excellent examples of ingenious small print heads for clay include this one by Studio Unfold from 2010, or this one by Richard Horne from 2012. UK-based Jonathan Keep created and shared a wonderfully simplified delta clay printer with a slightly larger capacity syringe in 2013. These print heads work well but are limited to using a relatively modest amount of clay, significantly limiting the size of objects able to be printed. To overcome this material limitation, the “supply” or “feed” of clay can be separated from the extruder. In 2015 two European companies, WASP (Italy) and VormVrij (Netherlands) released clay printing systems which coupled an air pressurized clay “feed” with a motorized auger printhead. In 2015 a US-based company, 3DPotter, released a very large capacity clay printer which utilized a novel solution in which the printhead moves only up and down, while the print bed moves in the X and Y axes. The 3D Potter design did not use compressed air to move the clay to the printhead. 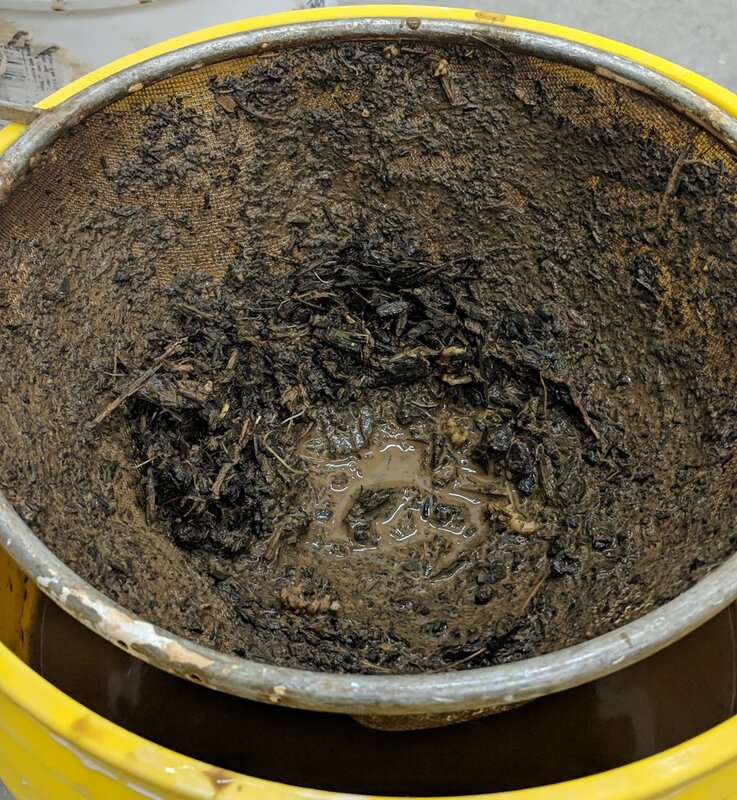 Instead, it used a mechanical plunger to move the clay. This seems to be the first extrusion clay printer with a large capacity to be mechanically controlled. However, the 3D Potter design does not make use of an auger printhead and as a result may have a limited ability to stop and start clay extrusion. Of course there is a great deal one can do with a continuous clay supply or “feed”. For example the work of Netherlands-based Olivier Van Herpt utilizes this process to great effect. I began 3D printing with plastics around 2008, and began building printers for use with plastic in 2014. In 2015 I began experimenting with clay printing and it quickly became the focus of much of my research activity at Penn State University’s School of Visual Arts, where I have taught since 2011. I decided the focus of my efforts in clay printing should be on developing a printer that combines elements of several existing designs, a printer with an auger printhead similar to those used by the WASP and VormVrij air compression fed systems, with the mechanical feed employed by 3D Potter. 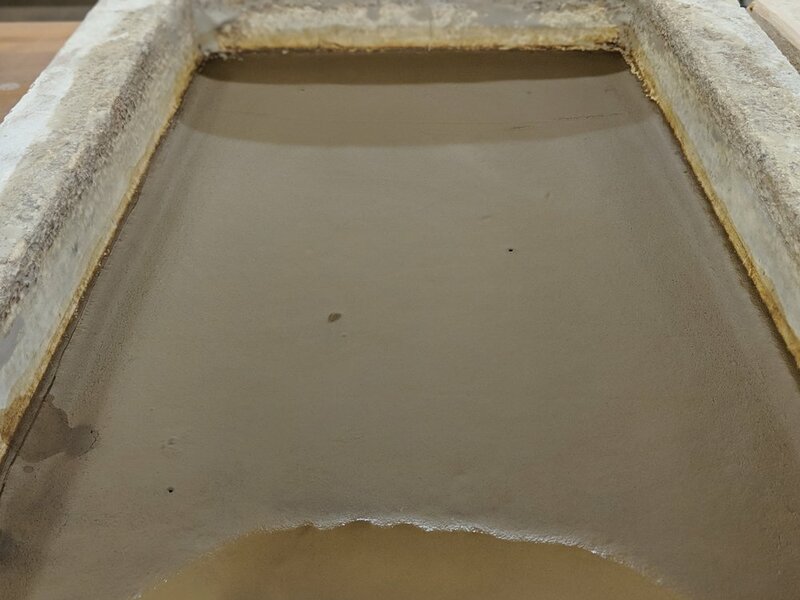 Printing clay with an auger printhead supplied with clay via an air compression system can work exceptionally well as evidenced by the many users of the WASP and VormVrij systems. However, there are some drawbacks to using air compression. First, in a home-built or D.I.Y. system, air compression may create a safety hazard if suitable materials and safety systems are not used. 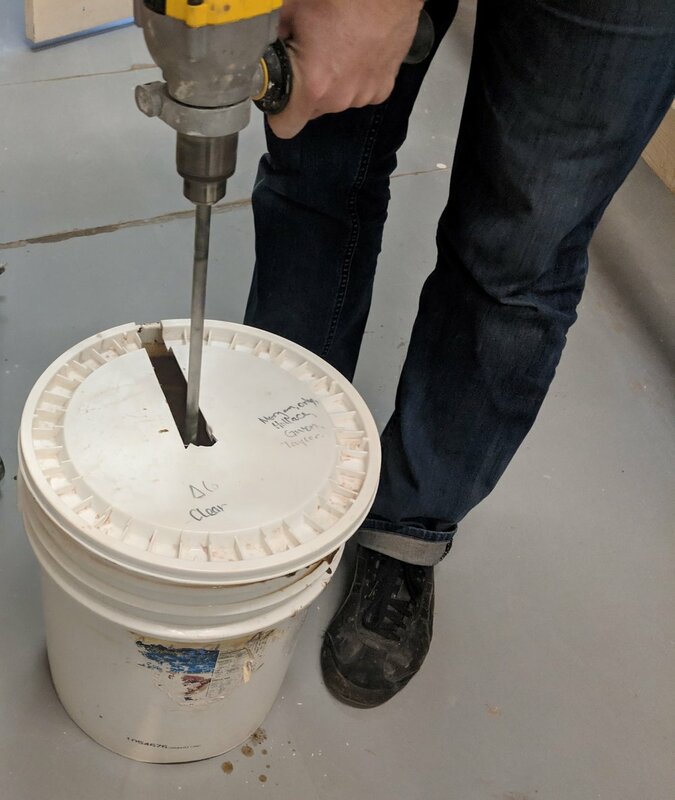 For example, under enough air pressure a plastic tube containing clay to be supplied to a print head can explode and send out sharp debris at a high rate of speed if a safety pressure release valve is not present or in the case of a compromised or damaged container. Second, an air compression fed system requires an air compressor. Inexpensive air compressors can be quite noisy, while quiet air compressors can be quite expensive. Third, an air compression system is always controlled independently of the printer firmware and control board. Without a software interface the air system is adjusted manually, via a pressure control valve. This complicates the system, as it in effect becomes a pair of overlapping systems - one analog (air compression) and one digital (control board). A mechanical clay feed system can be described as “volumetric”, in that one can measure precisely the volume of material used in such a system*. 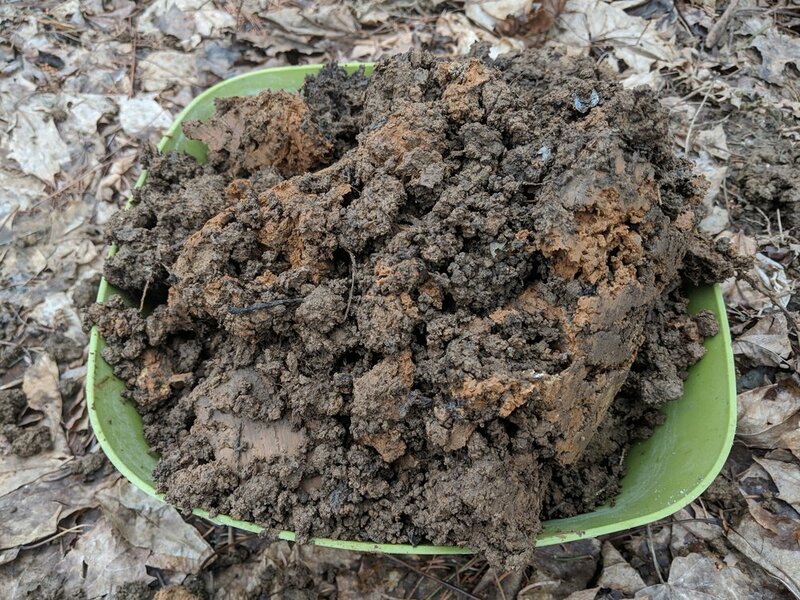 This is very significant because clay is a particularly complex type of material (I’m told it is a non-newtonian fluid) the properties of which can vary significantly from day to day as climate conditions change. In an air compression system, the exact right amount of pressure needed to move clay on one day may not be the same amount needed the following day. Similarly, a smooth porcelain may not need the same pressure as a gritty terracotta clay. Therefore, the user of an air compression system is likely to spend a considerable amount of time fine tuning the pressure feed. The accuracy of a volumetric mechanical feed system enables some additional useful tools that may be familiar to users of plastic filament printers. The exact amount of clay needed for a particular print can be automatically calculated by the slicing software. If one knows the cost of the clay, that can quickly allow one to determine (again via the slicing software) the cost of the print. Additionally, changes in the speed of printing or pauses in the printing can be handled seamlessly in the mechanical feed system. Changes in print settings during the print effect the entire system, rather than part of the system. If one should decide to change the diameter of the print nozzle, this too can be automatically compensated for in the slicing software, with tremendous and repeatable accuracy. *I should pause to point out that this is also true of Dries Verbruggen’s air compression system utilizing a Moineau type extruder manufactured by ViscoTec. However, the ViscoTec system is comparatively quite expensive and is also proprietary. As of January 2019, I am not aware of an open-source Moineau extruder system that works reliably with the durability needed for prolonged use with ceramics. **It is worth pointing out that when a mechanical-feed printer attempts to over-exert itself the typical result is a stuttering motor - which tends not to cause any damage to the motor. In an over pressurized air compression system, the results can be significantly more dangerous . That is to say, if the speed of the print slows down, or if a number of non-printing travel moves take place the pressure in the system will build and build and the flow of material will be too much or too little, or in an extreme case (such as pausing the auger but not the feed) an equipment failure of some kind could occur. The solution would have to be a synchronization of both the feed system and the auger extruder. In the paralell world of plastic printing the function of extruding, pausing, and retracting the plastic filament is all controlled by one stepper motor feeding the “hot end” of the extruder. This set of actions, typically mapped to the E0 (extruder 0) output on a control board are repurposed in clay printing to control the auger screw in configurations such as those manufactured by WASP or VormVrij. Many control boards have an E1 (extruder 1) output allowing a second extruder to be used (the first one being E0). So we could of course have both extruder 0 and extruder 1 perform the same commands in parallel. However, the motor needed to turn the auger screw did not need to be very powerful but needed to turn relatively quickly to be effective. Conversely the motor needed to push the clay supply had to be tremendously powerful and also to turn at a very slow rate to advance the mass of clay slowly enough to match the nozzle output. 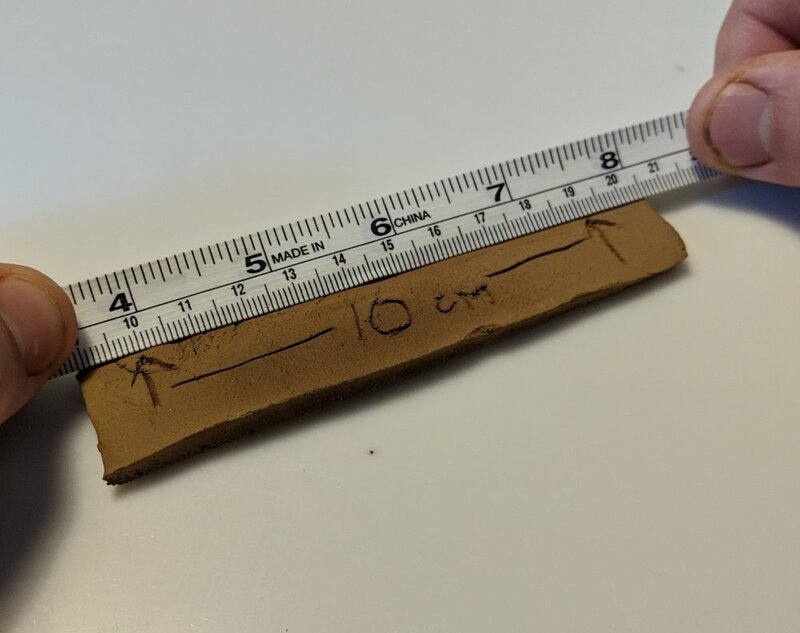 For example, we sometimes like to supply the clay from a container which has a diameter of 50.8mm (2”) and push it through a nozzle as small as 0.6mm. This means the supply diameter is more than 84 times larger than the print nozzle diameter. Synchronizing these two motors as they are performing two very different types of activities was a perplexing challenge that I kept returning to in April, May, and June of 2016. While tinkering with clay printing, I continued to reconfigure my home made plastic printers and I would try to keep abreast of developments in that space. While looking into the various firmware that are available for printer control boards I came across a post on Reprap.org titled “Repetier Color Mixing”. The post (dated January 18, 2016) references a document called “Color Mixing Theory.txt”, the first appearance of which I can find is on Github posted in 2014 by user “Repetier” who I am assuming is the original author. This post detailed a means of setting up firmware to work with a plastic printer hotend called the “Diamond hotend” which allowed three independently controlled filament lines to converge in one print nozzle. The system of firmware color mixing allowed nearly any color in the spectrum to be produced by blending colors in particular ratios. For example, a blend of 50% red and 50% yellow would yield an orange output. This was of limited interest to me as I was a plastic printer user who was in no way excited about plastic as a final “presentation” material, whether single color or full spectrum. However, it occurred to me that what the color mixing firmware idea did that was remarkable was that it allowed several extruder motors to advance material at different but variable rates while also staying perfectly synchronized. For example, you could be extruding color A at 10%, color B at 60%, and color C at 30% but when the printer paused extrusion for a travel move all three motors would stop at the same time. Similarly, if you adjusted the flow rate of the printer, the flowrate of all three extruders would be increased. At the time, and still today, this strikes me as almost magical. with the M164 command . . .
initalized with Wx and we also Compute the sum S of all weights. Needless to say, I was extremely excited to find this bit of code and eager to put it to the test. On June 6, 2016 I hooked up two very different motors, a “standard” NEMA 17 stepper motor and a NEMA 23 motor with a 15:1 gearbox, to a RAMPS 1.4 control board running Repetier Firmware (at the time the only firmware to my knowledge employing this color mixing capability) and sent a simple extrude command to the motors. To my great surprise (I have no background in this type of thing) it worked exactly as I hoped it might. The two motors did spin at different speeds, but stayed synchronized in terms of stops, starts, and pauses. I quickly made a video of this and posted it to YouTube and the Google+ clay printer forum. The video is spectacularly boring, but before long I had the motors actually working and printing clay in a far more compelling video of an earlier printer design. And yet, having worked relentlessly on clay printing for four years now, this is still the most significant thing by far I have contributed to our open source community, the idea of using color mixing firmware to control a clay printer fed and auger spinning at different and independently variable rates while remaining synchronized. 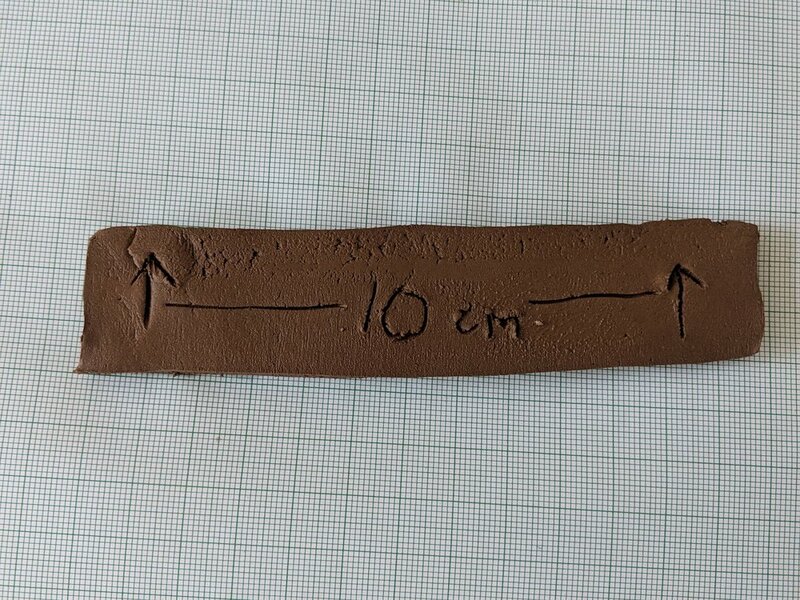 The community of clay printing is small and the stakes are therefore not so high, but it can be useful I think to point out a “first” when someone solves a little problem. * So far as I can tell, I was the first to implement this color mixing process in this way to control a mechanical feed auger printhead on a clay printer. *Some other firsts (as I understand them) from the clay printing community: 2009 - first extrusion clay printing to produce artworks, Unfold Studio. First use of an auger printhead for extrusion clay printing, Jonathan Keep, 2014. First design of a clay printer wherein the X and Y axes move the print bed while the print head moves only on the Z, 3D Potter, 2015. First dual extrusion 3d clay printing, Vorm Vrij Lutum, 2016. This particular color mixing printing process was first implemented in the open source Repetier firmware in the 0.92 release in 2014. When I became interested in utilizing this process I was using the open source “Marlin” firmware, which in June of 2016 did not have a color mixing implementation. It was a little tricky to switch firmware, but not terribly difficult. I liked Repetier in general, even though most of the 3D printer community I interacted with used Marlin, so I was less in tune with the “mainstream” at least amongst clay printing enthusiasts. Marlin did eventually implement color mixing in the version 1.1 release on May 4, 2017. By August of 2017, Jonathan Keep had implemented Marlin’s version of the color mixing firmware on his delta format printer which he posted about here and documented more thoroughly here. While the Repetier implementation worked well for me, I knew I was going to eventually want to use multiple colors in clay printing (something I am finally beginning to explore in early 2019) which was going to require at least four extruder motors to accomplish (Each extruder in this mechanical feed setup uses one motor for “feed” and another for “auger”, so a dual extrusion setup would have four total extruder motors, and so on.). I had also switched from a modified Prusa i3 style printer to my own custom design printer which employed lots of custom aluminum, extrusions from OpenBuilds, various CNC milled plywood components, and some bicycle wheels, among other eccentricities. My printer began to look like this. In short, I had stopped looking at this project as a low-cost modification of an inexpensive and widely available Prusa-style printer. I had started over, having gotten a couple thousand dollars of research funding via a few grants I had been a part of, with the intention of simply making the best clay printer (for my particular needs) that I could make. In looking for better components than what I had previously been using I came across the powerful open source Duet 3D control board, which runs the open source RepRap firmware. This 32 bit board offered color mixing implementation, which I could not find in the competing 32 bit Smoothieboard. The Duet 3D also offered significant expansion potential via add on boards. While it was considerably more expensive than the generic RAMPS boards one can purchase from numerous interchangeable and occasionally questionable resellers, the Duet 3D quickly won me over with a slick web-based interface and astonishingly thorough tech support from the principals of the company. I could ask a theoretical question on the Duet 3D forum and get an extremely well informed response or responses in a short time. Having used this board now for maybe 9 months or so I continue to be very impressed by it. The color mixing capability in the Duet 3D is in my opinion much more robust in terms of how you access it and control it than in the either Repetier or Marlin implementations. The Duet allows you to define a “tool” - and that tool can be composed of many elements. In my case the clay printer extruder is a single tool made up of two components - a feed motor and an auger motor. Each can be manipulated in real time and controlled independently as the print is printing. So if you sense you need a little more feed you can move a slider on the web interface and more clay comes from the feed. You can speed up or slow down the auger using a similar slider, if you feel the auger is not keeping pace or if it is spinning too fast and generating unexpected patterning in the print surface. 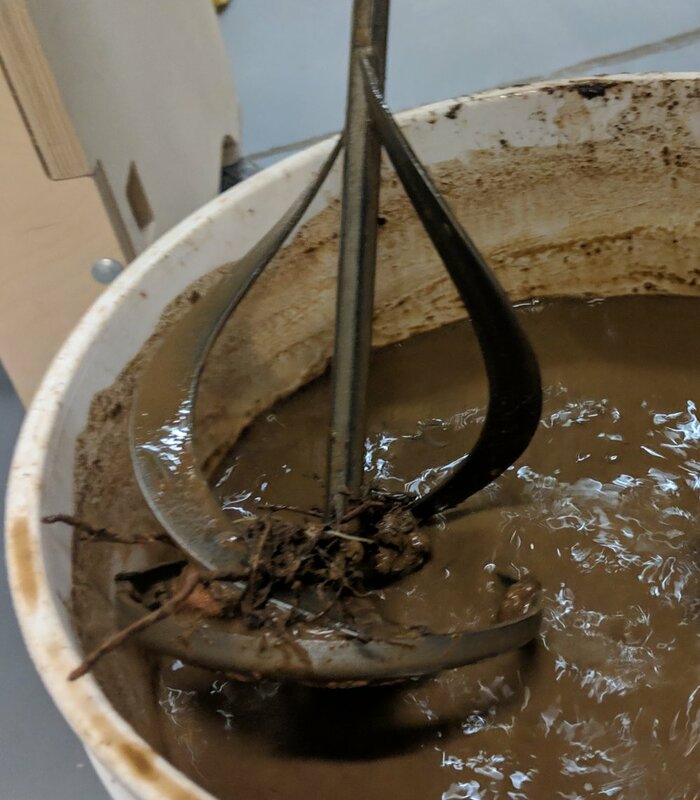 In order to set up color mixing to perform the clay feed and auger processes I needed I referenced this post and made changes that suited my particular printer setup. When I was using Repetier, I referenced this post and made changes that suited my setup. If one wanted to implement this process using Marlin, Jonathan Keep’s post which I linked to previously is a great start. I am very pleased that many mechanical feed auger extruder clay printers seem to be turning up on the Google+ clay printing forum, including those by Alptekin Görünüş , Anatoly Berezkin , and Cerambot. I don’t know the specifics of how these designs implement color mixing, or what firmware they may be running, but the momentum is exciting to see. Sadly, Google is “sunsetting” Google+ in a matter of weeks, and our forum will likely disappear until it materializes elsewhere. We are working to preserve this esoteric body of knowledge and relocate it to a more stable home. I hope this community will stay intact ad continue to innovate in the very specific realm of D.I.Y. extrusion clay printing. Personally I have once again assembled a small team of engineering students to study Polychromatic and Multi-Material approaches to clay printing via dual extrusion. Our hope is to meet once a week throughout the coming semester and perform some kind of test in each of our meetings. 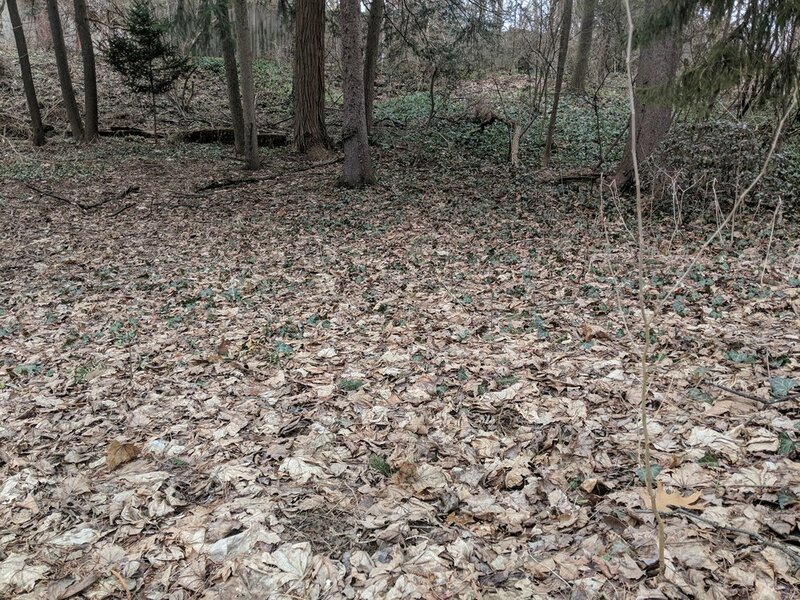 I hope to have some results to share with you this spring. Jonathan also presented at the Stuckeman Center for Design Computing here at Penn State’s Stuckeman School of Architecture as part of their 2018 Flash Symposium. His artist lecture covers much of his career with an emphasis on recent developments in his studio practice. *the audio is poor for the first 20 seconds, and excellent thereafter. *This text accompanied the presentation “Clay, Computation, and Culture” which was co-presented by Tom Lauerman (USA) and Jonathan Keep (UK) at the 2018 NCECA conference. A video of that presentation can be seen here. TL: I read a text on your website about the "Language of Pots" project, and the author describes you at that time as "a complete novice at computer technology". Fast forward a few years and you are doing pioneering things with 3D Printing. What was the spark that caused you to look anew at digital technology? Around the year 2000 I was introduced to computer 3D modelling and being more interested in form rather than surface I became fascinated by just how powerful the technology was for manipulating form. Cloning, copying, mirroring and distortion through numerical values was giving me forms I would not normally have arrived at using conventional ceramic techniques. Slabbing offering a form of a certain quality, throwing being a centred symmetrical shape, coil building offering more flexible. At the turn of the century computer modelling (or CAD) had transformed how architects were visualising form so I was thinking why would potters not do the same. Around 2007 I was invited to a symposium in Denmark around the use of computers in ceramics. By now I was getting more and more stuff in my computer and wanted to get it out as physical forms and 3D printing was obviously the way. At this symposium there were designers with stuff printed in plastic and plaster and the suggested convention was to do the same and take mould and then slip cast if you wanted forms in ceramic. This just did not make sense to me. I wanted to go just straight from digital information to ceramic form. Also I wanted the printer in my studio. I did not want to have to send work off to a bureau. I wanted a tool that could sit next to the pottery wheel in the studio and do the job. I wanted to creatively understand the tool and to be able to work with it. I believe in the process and the material to be incorporated into the contentment of the work. So I began researching the possibilities of 3D printing in ceramic. At this time I was in contact with Prof Adrian Bower (originator of the pioneering RepRap open source 3d printer project) and he said he was sure clay would be possible as an extrusion but a knowledge of computer engineering and computer code would be useful. Obviously I had neither but I did know clay so could begin experimenting with the extrusion using a hand-held syringe (analogue) that resulted in the ‘Syringe Form’ series. I was rising 50 and on the assumption it is never too late to learn I thought I must teach myself computer coding at least. This was not so much to deal with the computer engineering but more as a way of working creatively. I had found (the open source software package) Processing and really wanted to get to the point where I could grow pots in code. I could see the possibility of virtually growing forms of much more complexity and interest with computational aid. Above all I believe an artwork should reflect the age in which it is made so considering we live in a digital age it is absurd not to be making pots using digital technology. So although around the end of the 2000’s I was trying to get some kind of ceramic 3D printing going it was the Belgium, Antwerp based design couple UNFOLD who cracked it. In the Autumn of 2010 checking 3D ceramic printing on the internet Dries and Clair’s early experiments popped up. They had got an Adrian Bower machine that was by then being sold as a kit by a start up company here in the UK (Bits for Bytes) and replaced the plastic print head with a pressurised clay filled syringe. I contacted them showing what I had been doing with hand held syringes and we have been working together since. 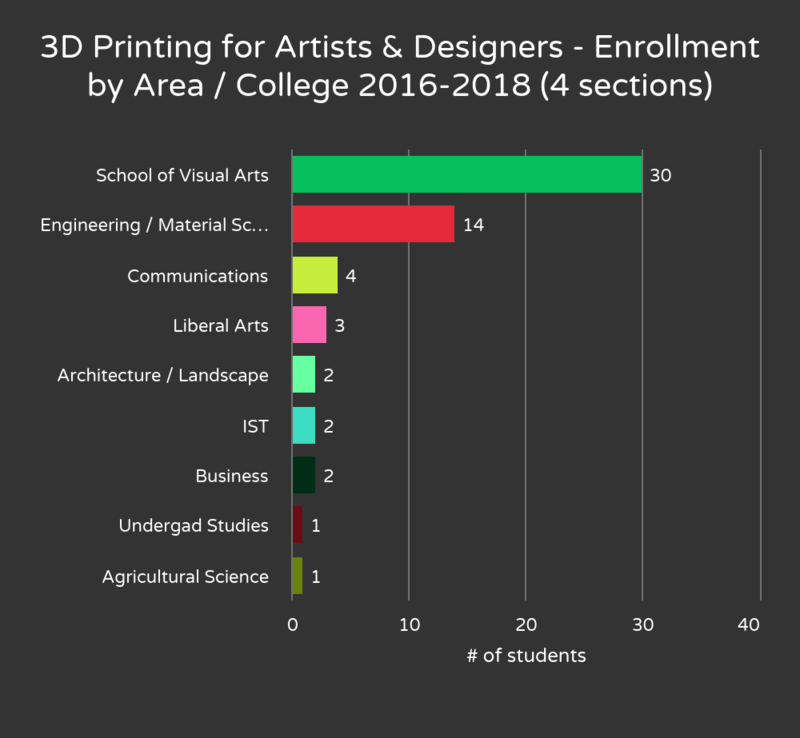 Many universities are building out very comprehensive 3d printing facilities - however, the tendency is for these facilities to be almost completely hands-off. It's understandable, given the cost of equipment, the fragility of the process, and the carelessness of some students - but I'm always asking "what art movement can you think of in which the artist has almost no access to, or close oversight over, the means of production?" My observations are that because the hardware is what people tend to see they are of a mindset that that is what it is all about while I always place the emphasis on the generation of the digital content, not the output. On my visits (to schools) I always place stress on ‘new ways of working’ - that it is not the printer that leads to new forms of expression but the whole tool set and first you must generate the work. The printer is just the output tool. I make the claim that however hard all the techie stuff is (keeping the printers running etc) it is even more difficult to come up with something worth printing. I think it is fascinating and exciting that Processing is the tool you prefer for generating the forms in your 3d printed work. There are alternatively many more specific design software packages (both open and closed source) which provide a very visual representation of the object being designed. Some design software even include "sculpting" tools, which resemble very closely in shape and intent, clay modeling tools such as a trimming tool, a needle tool, or a smoothing or shaping rib. Authors of those software packages seem to want to provide artists and designers with digital tools that resemble tools which are familiar. This is taken even further via input devices such as a pressure sensitive stylus, or at a more elaborate level, haptic feedback devices, as well as augmented reality and virtual reality systems. So, in this vast software/hardware/accessory landscape, where great effort and resources are put into "blending" digital processes with real world sculpting methods, you have chosen, despite decades of experience with hand tools, to develop your forms in a far more abstract way, via coding in Processing. How does this layer of abstraction and/or translation inform your work? It was that ‘blind forming’ in code that interests me. As you are aware ‘form’ is my driving fascination. So the question for me is then, assuming we and our psychological make up has evolved out of the same natural system out there in the wilderness what is the relationship between natural form and artistic form. I was seeing how scientist were gaining a better understanding of us and our world through computational modelling and thought why can’t artists be doing the same. For me code becomes a material. When working on computer the code, the binary system and process of computation becomes the material with which I am working. As with working in any other material you want to learn it properties, its strengths, the processes that are required to transform or manipulate it. A commentator pointed out that this is the craftsperson in me and possibly it is but it’s the way I work. Now with the experience I have of clay as a material when I am working in the computer material I need to bare in mind the transformation that is going to take place between the digital form and the clay form and make allowances knowing that I am working in different materials. When I teach proprietary and potentially expensive software I worry that I am setting students up for disappointment when they graduate and look into purchasing these software tools. You seem to use an entirely open source tool chain, which you may have gravitated toward for any number of reasons ranging from economics to politics. 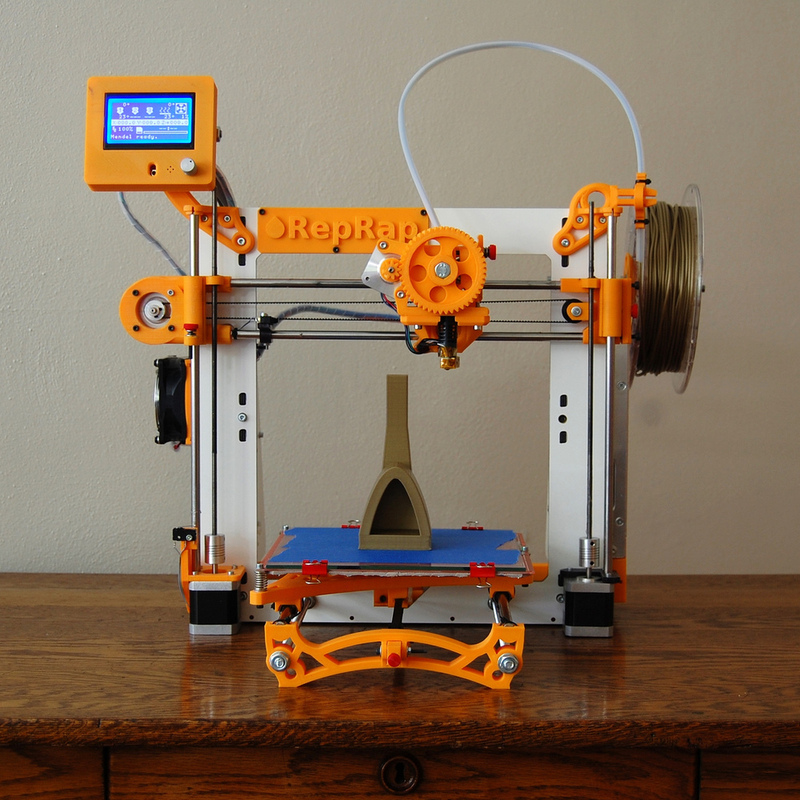 Your printer design is an excellent example of open source hardware. Is your use of Open source hardware, firmware, & software of tremendous personal importance? Thinking it through I have decided for me it is about self empowerment. I have asked myself why I am drawn to it, can I call it an ethos – the ethos of openness and sharing. I’m into it for economic (or anti-economic) reasons, political reasons, social reasons but ultimately it’s because I do not like being beholden to others. I like my independence and feeling wherever possible to be in control, be self empowered and that now rather broad swath of activities that has been clustered under Open Source offers that. I gather Open Source was first known as Free Software – free as in freedom. I like that. The first real experience was with the RapMan printer UNFOLD converted and I copied back in 2010. This was a flat pack kit offered by a UK company Bits for Bytes that had developed out of Adrian Bowers work at Bath University. 3D Systems bought out Bits for Bytes and stopped the production of the RapMan. So all of a sudden access was denied to the kit I was using – a loss of empowerment I guess. It really brought home to me the importance of ‘openness’ not only for myself but the community of like minded folk. While I had fallen into this way of working using open source software purely because it was freely available (Blender, Processing, Skeinforge) it was when I began doing workshops that its importance was assured. Being self employed I did not have access to institutional licenses to proprietary software so the choice had been economic and pragmatic rather than I was steered away from other softwares. When I began workshopping it was so easy everybody would have access to the same software – there was no ducking and diving using illegal software or people barred from use because of price. From then it has become a point of issue. I do not buy software and it is with pride that I am empowered by the generosity of others to be able to do what I do. So I guess in answer to your question as to whether Open Source hardware, firmware, & software is of tremendous personal importance the answer is in its broadest terms it is ‘me’. Thinking about it, it is not a point of importance but more of ‘identity’. I want to lead a good life that leaves as small a footprint as possible and that is free and open, as in freedom. Jonathan Keep is a leading exponent of studio based ceramic 3D printing. His work is recognisable for an emphasis on form that he generates using computer code. Born in South Africa he lives in the UK and gained a MA from the Royal College of Art. Exhibits and lectures internationally. Tom Lauerman works within the overlap of sculpture, craft, and design. His work explores emotional capacities of constructed spaces. Tom received an MFA from Cranbrook Academy of Art and BFA from SMU Meadows School. Tom exhibits nationally and internationally and is presently an Assistant Professor at Penn State University. My career as an educator began as a part-time teacher of 2nd grade art. A few years later I found myself teaching at Lillstreet Art Center, Gallery 37 ,and After School Matters, all of which are community-oriented programs addressing diverse populations within the city of Chicago. Higher education experience came a bit later as I briefly served as a part-time instructor at the College of DuPage, in Chicago’s western suburbs. Teaching at that time was one of a number of activities I cobbled together to create something like a basic income that allowed me to make and exhibit artwork. A year or two later my wife, Shannon Goff, and I were very fortunate to have both been hired as adjunct instructors at the School of the Art Institute of Chicago. Over three years we learned innumerable things working at SIAC. Among the many perks of the place were the ability to pass in and out of the attached museum freely and an opportunity to work closely with colleagues including Matthew Groves, Helen Maria Nugent, Delores Fortuna, Xavier Toubes, and Katherine Ross. We loved SAIC, but grew uncomfortable with the precariousness of our adjunct appointments. We made a clean break from the city of Chicago, gaining experience at a range of institutions including the Meadows School of the Arts and the Rhode Island School of Design. Over the years the two of us have taught at 9 different programs of higher education ranging from public to private, large to small, overlooked to overrated. Our lives and our careers changed more abruptly in 2011 with the birth of our first child and our acceptance of two positions at Penn State University’s School of Visual Arts in 2011. While Shannon’s position was a tenure-track appointment from the start while mine was not. Encouraged by then Director Graeme Sullivan, I was able to propose and develop a number of new courses in the school’s curriculum, primarily around the area digital fabrication. Developing these courses was, and continues to be, a great thrill. I was able to work with students from a very wide rage of study and was able to pursue my own intense interests in finding connections between craft, art, design, and technology. These students have added a lot to the course and to my understanding of Art/Science collaborative possibilities. Most of them have not enrolled in an art course previously and may have minimal awareness of contemporary art. However, they often bring a problem solving mentality and a technical savvy that allows for more nuanced conversations and interactions around technology. In a perfect situation, I’d like to teach courses that were roughly 1/3rd art students, 1/3rd Design students, and 1/3 Engineering students. This would facilitate compelling cross-pollination and would enable students from all three disciplines to engage with collaborative work that can blur disciplinary constraints. The experience using our courses as a bridge between these disciplines has also caused me to reconsider my own education and influences. In particular, I find myself reflecting more on my mother’s work at Bell Laboratories and in the nascent computer industry in the 1960’s. At the same time that we saw this interest in Digital Fabrication courses developing from students of Engineering and Material Science my own research was well received by faculty colleagues in those disciplines. This was particularly true in the process of developing the custom D.I.Y. clay printer I have used to create much of the recent work featured on this site. I was fortunate to be a part of a few grant initiatives around 3D printing, in particular a grant around the idea of mobile makerspaces, funded by the National Science Foundation. 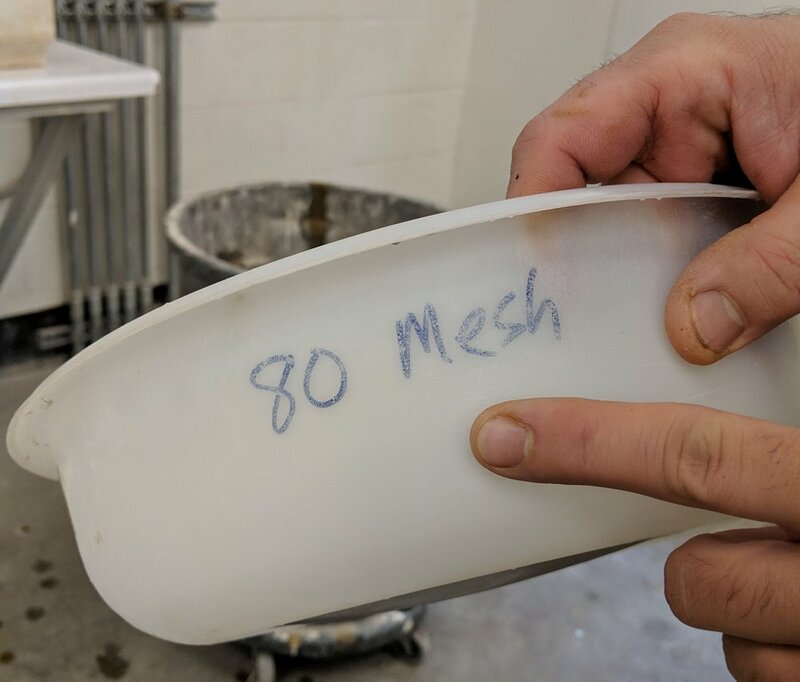 The influx of material and technical support from STEM disciplines has pushed our development of our own approach to clay printing forward tremendously and allowed us to make significant progress rapidly. In the process of this exploration and experimentation in curriculum and collaboration I would occasionally feel overwhelmed by how fragmented my work at the University could seem at a given moment. I worried that I had been taking on far too broad a range of activities. As is often the case, small collaborations became the impetus for potentially larger collaborations and some potential projects emerged that were quite surprising and in some cases very far afield from my home base of studio art. Some difficult choices were made in recognition of the fact that not all paths can be followed simultaneously. So, after a period of taking on new things, making new connections, developing new tools and new processes, I found myself contracting a bit in the last year or so. Giving thought to what the priorities should be from the perspective of making art, conducting research, and teaching in a classroom. This is ongoing work. I can suddenly take a more aerial view of the situation, and move forward with more confidence. A colleague recently retired, making possible a tenure-track position focused on the work, research, and teaching areas I have pursued. After seven years of full time teaching at Penn State I am excited and humbled to have been appointed Associate Professor of Studio Art/Ceramics/Digital Design. It is surprising to realize it has been 12 years since Shannon and I were first hired as adjuncts at the Art Institute of Chicago. I always feel as if I am just getting started, but the circumstances of a new position underscore this feeling. I’m hopeful that I can pursue a long career of teaching in which my work and research maintain relevance. I’m hopeful that where we are now is something like the End of the Beginning. The following text, written in 2016, outlines how I became interested in open source clay printing . . .
After some time spent experimenting with many approaches to 3D Printing in clay, now is a good time to begin sharing some of the ideas, thoughts, failures, and the occasional success we have come across. I also hope to use this space spotlight a number of remarkable projects and and the individuals behind them. In becoming familiar with the processes of clay printing I've benefited tremendously from the shared insights and efforts of a large and growing group of artists, tinkerers, engineers, designers, students, teachers. These individuals are interested in combining fairly new 3D Printing technology, which has been around for about 30 years, with the less new processes of shaping clay into sculpture, which has been going on for about 30,000 years. Personally, I've been interested in 3D Printing (aka "Rapid Prototyping" or "Additive Manufacturing") from the moment I first learned about the process during a lecture by the artist Tony Hepburn in 1999. It would be 9 more years before I would actually have a chance to print something of my own, but in those intervening years I was able to learn the practice of 3D modeling with open source tools like Blender, and the powerful freeform modeling software Rhino. In 2013 I finally gained hands-on access to a 3D printer when my employer, Penn State University's School of Visual Arts, purchased a MakerBot Replicator 2. After a year of constantly repairing the MakerBot I built my first 3D printer, following (and altering) the excellent Prusa i3 design, in 2014. After printing hundreds of plastic objects and becoming increasingly excited about the potential for the 3D Printer as an artist's tool I became more and more interested in moving away from plastic as a printing medium. I was ready to start attempting to print with clay in the summer of 2015. As an artist with no training in Engineering, I was remarkably fortunate to cross paths with Dr. Timothy Simpson, Co-Director of Penn State's Center for Innovative Material Processing through Direct Digital Deposition (CIMP-3D). Dr. Simpson connected me with the College of Engineering's Learning Factory capstone design program. Through the capstone project program I have been able to work on various approaches to clay printing with more than a dozen undergraduate students from the areas of Mechanical Engineering, Industrial Engineering, and Material Science over the past 12 months. Before I began experimenting with clay printing my interest in the process was nudged along in 2014, when British Potter Jonathan Keep started an internet forum titled, simply enough, "Make Your Own Ceramic 3D Printer". The site began as a place for Jonathan to post and disseminate instructions, technical advice, and tips for anyone interested in building the clay extruding printer he had designed in the previous year or a bit earlier. I followed this forum closely then, as I do now, gradually shifting from onlooker to active participant. It turns out clay extrusion printing predates Jonathan's work as well. Unfold Studio of Antwerp Belgium began developing compelling projects via clay extrusion as a 3D printing method in 2009, using an early modified "Rapman" printer. Dries Verbruggen of Unfold points out in an article he authored that the RepRap open source 3D printing project began with a syringe type extruder way back in March of 2005. The work of Dries and Jonathan, which builds upon the RepRap project begun by Adrian Bowyer, are all examples of Open Source designs. Information is shared freely, interested individuals around the world build their own versions of these designs, make changes, and share those changes. 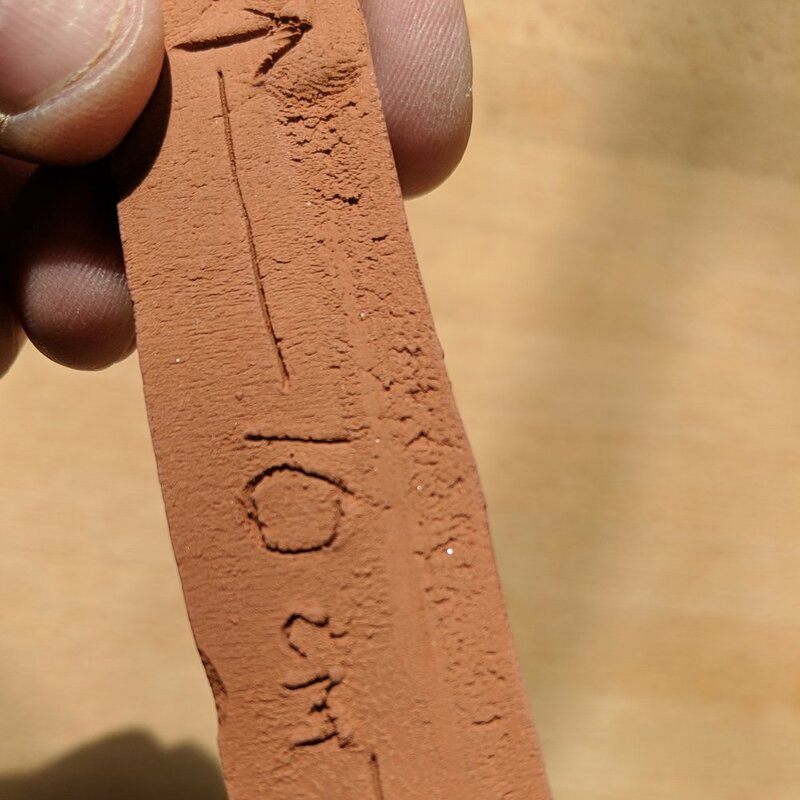 Other approaches to clay printing and research dissemination exist as well, in which research is directed toward a patent possibly leading to a commercial enterprise. However, in this space I am going to preference open source projects and development for a number of reasons. The most important reason is that all of the underlying processes are accessible, able to be studied, duplicated, and even altered. So the purpose of this space is to share insights into why 3D Printing in clay has become a personal obsession for me rather than to focus on how the process works. I hope to share much more insight into everything and everyone I mentioned in this brief post. I'm curious whether 3D Printing in clay is destined to be a niche activity which might appeal to just a few eccentric artists and designers, or if it is something we might see as a very widespread activity throughout schools, workshops, and studios. I could make a case that clay is an all-around better material for 3D printing than the plastic used in nearly all consumer and hobbyist printers - and for a number of reasons. More on that, and everything else, later . . . I first encountered Tony Hepburn during his brief stint as a visiting artist at the university I attended while earning an undergraduate degree in painting. I watched for several days as Tony built one of his iconic gate sculptures. He was handling clay as if it were lumber, and working on an architectural scale. Big, seemingly dry slabs were assembled with copious amounts of drippy clay slip. His process was astonishing, as was his ability to work with such focus, in public. As quickly as he had arrived on campus he was gone. Tony's visit was just a few days. His gate, however lingered around the department for the remainder of the semester until it was later fired, crated, and shipped. I walked past it each day and contemplated the individual who had put it together. But I didn’t get to know him then. So, in 1999 I was able to take a two week workshop with Tony at the Anderson Ranch Arts Center near Aspen, Colorado. I had been out of school a few years, had been working very hard, but had been doing so in a vacuum. I was craving intellectual dialogue and critique. I was eager to encounter foreign ideas and individuals. It would be a tremendous understatement to simply say those two weeks with Tony changed my life. I can look back at those intense, funny, and enlightening days and recognize them as an introduction not only to Tony, but to what the life of an artist and educator can be, in its most potent formulation. Tony’s energy and his understated humor and his astonishing insights crackled with a strange, relentless intelligence. That encounter led me to Cranbrook Academy of Art, where for two incredible years I was fortunate enough to become a part of the remarkable environment Tony had carefully cultivated. While there, Tony introduced me to so many remarkable people, and carefully explained to me the most astonishing concepts. Typically we met one-on-one, once a week, early in the morning, before the studio came to life. Our conversations evolved unhurriedly, in hushed tones, with many pauses for thought, and no small amount of emotion and intensity. On one such morning he wrapped up our meeting and asked me to give a tour to a prospective student, Shannon Goff. Several years later, but again at Cranbrook, Tony was in attendance as Shannon and I were married. In the past few months I knew I would get word one day soon of Tony’s passing. He had been very ill. I am thankful that I was able to tell him how much he means to me, to us. I have kept him in my thoughts every day. I made some objects spelling his name, the way he often did, just to think of him and try and connect with his remarkable energy. On January 4th 2015, I flew out to the Anderson Ranch Arts Center where I led a “January Intensive” workshop. I had not returned to Anderson Ranch since that first encounter with Tony 15 years ago. On day one of the workshop I got the call about Tony I had been dreading. As Shannon told me the news I walked into the surprisingly tiny, cluttered, and utterly unassuming log barn where I first began my lifelong conversation with my mentor. I looked around, trying to remember on which wall he had tacked up his large drawings, on which table he had laid out his eccentric tools. Scanning the room my eye came to rest on two deconstructed watering cans on a high shelf on either side of the room. Tony was gone, and yet here was Tony. The two large spout ends resembled two enormous eyes, observing the work of the studio, surrounded by the work of so many of his friends and rivals and collaborators. Rest In Peace Tony, Thank You for opening my eyes and my mind and my heart. *for an in-depth accounting of Tony's remarkable life and career, please read Paul Kotula's memorial at the Cranbrook Academy of Art website. Materialize: words about the exhibition. I was recently asked to be the juror of and featured artist in an exhibition titled Materialize, currently on view at the Robert & Elaine Stein Galleries on the campus of Wright State University, Dayton, Ohio. The exhibition presents objects and installations utilizing a spectrum of digital fabrication tools in their making. The jury process has not only introduced me to the work of a number of compelling artists but also (thankfully) provided a moment of reflection from which this brief text emerged. It is intended as a snapshot of an emerging field, quickly coming into focus. I hope to soon post Images of the exhibition and highlight a few of the individuals participating in it. Click on the image below to open the text as a PDF. Materialize runs through December 7th. The exhibition will also be traveling to Purdue University Galleries (Fountain Gallery, Lafayette) from January 13 through February 21, 2015. Back in March of 2014 I was fortunate to have been selected to participate in a 3D Printing Panel organized by Tom Burtonwood and Rachel Clarke. The event was part of the College Art Association's New Media Caucus and took place during the 2014 CAA Conference in Chicago. An article detailing the event has just published in the journal Media-N. It is a good primer on the technology of 3D printing, some of it's current and future challenges, and a bit of insight into how artists will engage this technology. Check out the article here, or the pdf version here. 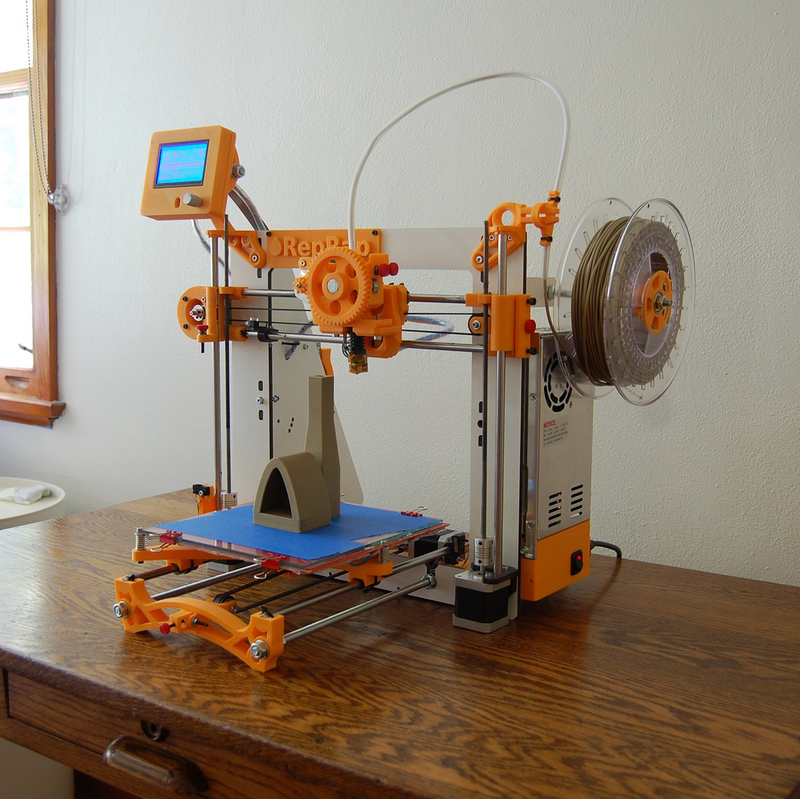 From May until August, 2014, I made, unmade, and remade my first home-built 3D printer. 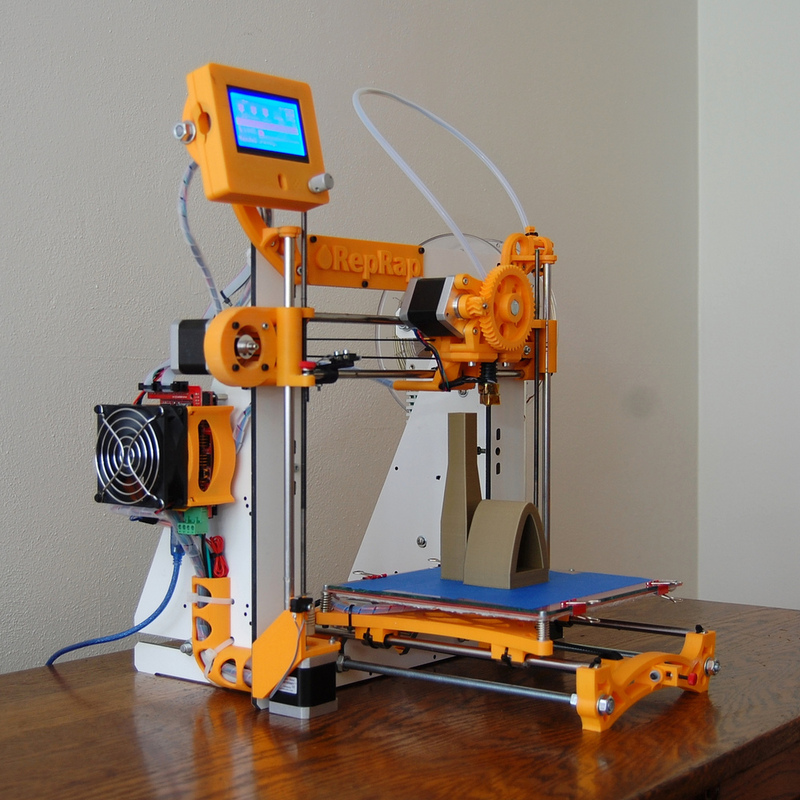 It's based on the open-source RepRap project, derived specifically from the popular "Prusa i3" plan. Ultimately though, I redesigned nearly all the parts, even if much of my redesigning was subtle (rounding a blocky shape for example). The whole experience has been tremendously rewarding, despite the almost absurd amount of time committed. I suspect I'll build more. And I will post my design files someplace for others to re-use them or iterate them further if they choose. I had hoped one printer would be enough to satisfy my curiosity, but the project mostly ignited a desire to build many variations: a printer for clay objects, a printer for large objects, a printer for detailed objects, and on and on. Open source is like playing with cards on the table. The game is clear, transparent. The open source key benefit is not that the project is free. You can see how it works. You can take it apart. You can fix it. You can improve it. Closer to home, many many thanks to Sidney Church and David St. John of Penn State School of Visual Arts and Engineering respectively. Both Sidney and David helped me feel capable of building a complicated machine despite a deep lack of experience with electronics, micro-controllers, etc. At present, I'm attempting to apply all of these ideas to a new course I'm teaching titled: "D.I.Y. Digital Fabrication". The goal of the course is to empower artists, designers, and craftspeople to construct custom, low-cost, open-source Digital Fabrication tools which can perform at a very high level despite being home-made and composed of generic bits and pieces. At the same time, it is my hope that our group will consider all the moral, economic, and cultural implications of these technologies while considering how a D.I.Y. approach fits within the larger picture. Oh, and likely we'll make some Art too, because it is an Art class of course. It is a fascinating time to be getting involved in this technology as it shifts from institutions and corporations to individuals. Is this the 3rd Industrial Revolution? Maybe so. A lot of hype? Perhaps. At any rate, it all reminds me of the feeling of turning on a personal computer in the 1980's. Confronting a pretty basic and awkward technology with astonishing, revolutionary potential. For the last five or six years I've been collaborating with Fabio J. Fernández on a series of of objects titled Sculptures in Love with Architecture. Our project began as a simple work exchange. I think I made an object based on one of Fabio's drawings to trade with him, or vice-versa. Somehow that project has grown in to a body of work that includes more than two hundred objects and as many drawings. The objects in the series are very small in size but I'd argue they are large in scale. Their proportions relate to the architectural sources that have inspired them. They are model-like even if they aren't models. Models are plans for larger structures. Despite being able to fit in the palm of your hand, these objects are unabashedly full size. As an artist you get used to trying to compete for attention, make a splash, stake a claim to a space. So when you scale your work way, way down you also prepare yourself to have that work ignored. To my surprise this body of work has not been ignored. Perhaps as a function of their size, or their simple and specific geometry, they have become internet-friendly. As a result of the images of these small objects pinging around in the ether, Fabio and I have been introduced to a number of interesting art & design enthusiasts and collectors from really far flung places. It means a lot to us, and has helped motivate us to keep this project moving forward during times when its hard to carve out the time and space required to communicate and collaborate. So, in no particular order, thank you to Sight Unseen, booooooom, Arthound, of paper and things, unruly, and various other tumblrs assembled by people I've never met. In many cases these mentions are simply an image or a sentence. Regardless, it is much appreciated. Many Thanks to Colette Copeland and Ceramics Art & Perception magazine for this intelligent review of "Under the Table". Thanks again to Margaret Meehan, who curated the exhibition. It was a pleasure to be included with many artists I admire including Kristen Morgin, Kate Gilmore, Tom Müller, Akio Takamori, Matthew McConnell, Jeffry Mitchell, and my longtime collaborator Fabio Fernández. Many thanks to Sam Newhouse of theartblog.org for this thoughtful review . . . 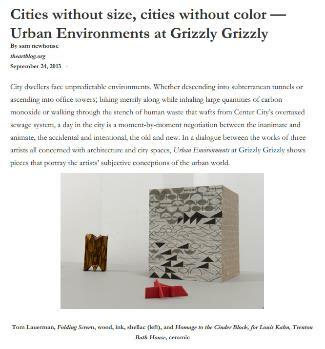 This September, Grizzly Grizzly is pleased to present ‘Urban Environments’, featuring the work of Philadelphia based artist Colin Keefe and the collaborative work of Fabio Fernández and Tom Lauerman. The exhibition, consisting of drawings and sculpture, explores systems of architecture, the built environment, and abstraction.